pellet stove is likely around 70%. 2016 and 2017 update - click here. 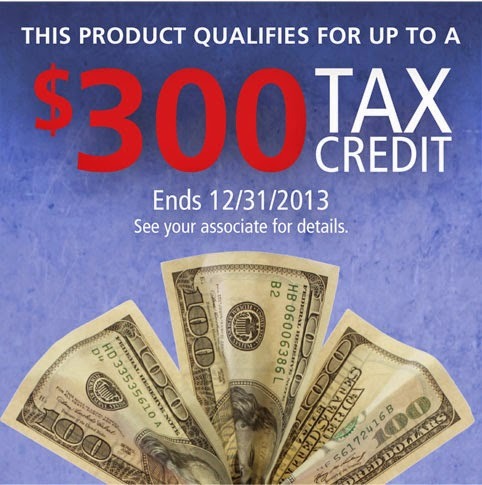 December 2015 update: On December 18, 2015 Congress extended the $300 tax credit through end of 2016. For more on the 2015/2016 tax credit extension, click here. December, 2014 - A short term extension of the $300 federal tax credit to purchase a new wood or pellet stove was signed into law by President Obama on Dec. 19, 2014 after having passed the House and the Senate. The law extends a host of tax provision through Dec. 31 2014, making it almost entirely a retroactive tax credit. A two-year deal that would have extended selected tax credits through Dec. 21, 2015 fell through. The tax credit, which started out at $1,500 applied to all stoves that were at least 75% efficient. The stove industry used a loophole to help ensure that all EPA certified wood stoves and all pellet stoves could claim to be 75% efficient. As a result, many consumers are unwittingly buying stoves that may be less than 60% efficient, or even less than 50% efficient. Pellet stoves in particular can be very low efficiency, saddling consumers with unnecessarily high pellet fuel bills. Of the nearly 500 stove models on the market, manufacturers have disclosed actual, third party verified efficiencies for more than 100 and they are listed here. To date, most of the major pellet stove manufacturers have refused to disclose any actual efficiencies. Seraph Industries, a very small pellet stove maker, has disclosed their efficiencies and they are quite high. The EPA, nor any other federal or state agency involved in wood and pellet stove education, warns consumers that they are not necessarily buying a 75% efficient stove, as promised by manufacturers who issue certificates assuring consumers that their stoves are eligible for the tax credit. The Alliance for Green Heat has been a long-time advocate of a robust tax credit, but only for stoves that are genuinely cleaner and more efficient. The federal tax credit has never incorporated particulate emissions into its eligibility requirements. Consumers who bought a stove in 2014, 2015 and 2016 can claim the credit on their taxes, assuming they have not exceeded the $500 limit for residential energy improvements. In addition to the federal tax credit, more states are beginning to offer incentives, including Idaho, Oregon, Maryland, Montana and New York. There are now more than 30 stove change-out programs operating in about 10 states that offer generous incentives. Free heating! Everything you need to know about owning a wood burning stove. Beat the recession and the energy crisis with a highly efficient, environmentally friendly, wood burner. The best thing is that wood is often available for nothing!